Rhonda ByrneThe Secret Daily Teachings is one of the most powerful tools you can use to transform your life into total joy. 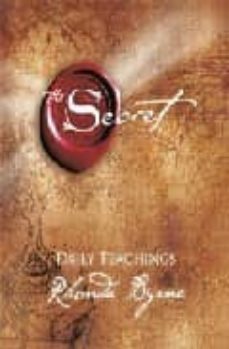 With its unique design and totally original content, it gives readers a daily opportunity to embrace more fully the concepts and principles that made The Secret an international publishing and cultural phenomenon. Rhonda Byrne provides a fresh insight, exercise or quotation on each page that will allow you to access the power within you to attract health, wealth, happiness and every good thing you desire. The text is inspired by the literally millions of email questions Rhonda has received since the publication of The Secret. Her warm, inspiring advice to them is collected here for the first time, providing a deeper understanding of the principles behind the original book. Designed to provide a new idea every day of the year, this book is unlike any other book or calendar on the market: each page can be removed and easily attached wherever the reader would like to see it - on a computer monitor, fridge, mirror, anywhere at all. The pages are contained in a paper-over-board case that flips open at the top, making this unusual book a beautiful and durable object. With 365 entries in all, The Secret Daily Teachings is a brilliant new way of using the principles of The Secret to increase you magnetic power and attract a magnificent life beyond your wildest dreams.